Magnetic therapy, more accurately termed magnetic field therapy, is the use of magnetic fields, generated by either permanent magnets or pulsed electromagnetic fields, for treatment of medical conditions. 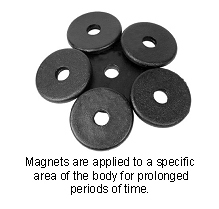 Magnets used for treatment purposes come in many different sizes and strengths, and duration of treatment varies with the type of magnet and condition being treated. Permanent magnets come in strips, bars, and beads, and are often taped or glued to specific areas of the body for prolonged periods of time. With pulsed electromagnetic field (PEMF) therapy, defined pulses of electromagnetic energy are delivered to the affected area in a series of treatments that each last up to an hour. What is the history of magnetic therapy in veterinary medicine? The use of magnets as a medical treatment was documented in China in 2000BC, and references to its use can be found in the early cultures of India, Egypt and Greece. Magnetic medicine continued to be explored through the ages, and the recognition of the presence of ions in cellular tissues and fluids provided a possible scientific explanation for the action of magnetic fields on living organisms. Magnetic therapy fell out of favor in the early twentieth century, as medical research became focused on drug-based therapies and biochemistry. In recent decades, permanent magnets have begun to be used widely in Japan, while in Germany low frequency PEMF therapy has become a popular form of treatment in both humans and animals. With technologic advances, equipment is becoming smaller, lighter, and less costly, making its application to a wider range of species more practical. On which species of animals is magnetic therapy practiced regularly? "Magnetic field therapy has been used for clinical treatment of horses for several decades." 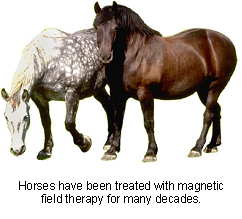 Magnetic field therapy has been used for clinical treatment of horses for several decades. Since the size of the patient determines the size of the magnetic field needed for tissue penetration, the original PEMF equipment was inappropriate for use in small animals. Improvements in technology have resulted in a relatively recent expansion into small animal and ruminant practice. Who practices veterinary magnetic therapy and do I need a referral? Permanent magnets can be purchased by the layperson in the form of magnetic strips, beads, wraps, harnesses and pet beds. Some specialized magnetic devices are only available through veterinary practitioners, including leg wraps, boots, and blankets. Permanent magnets can be difficult to keep in place on animals. PEMF equipment is only available by prescription and can be administered by a veterinarian or by a trained therapist under the direct supervision of a veterinarian in accordance with state or provincial veterinary acts. In some circumstances, referral may be required. What conditions are most often treated with magnetic therapy? The US Food and Drug Administration has approved the use of PEMF in the treatment of non-union fractures. As a form of treatment, magnetic therapy is most often used to enhance healing from injuries and wounds or to treat chronic conditions such as tendonitis, degenerative joint disease, hip dysplasia, vertebral disease, and lameness caused by other musculoskeletal or neurologic conditions. How can my pet benefit from magnetic therapy? Magnetic field therapy is a non-invasive form of treatment that may act as a form of pain relief in chronic degenerative conditions, and which can speed the patient's recovery from traumatic injuries. How successful is magnetic therapy? Anecdotally, many subjects attest to the use of permanent magnets as a form of therapy for both acute and chronic conditions, but few double blind studies have demonstrated its benefits. "Response to the use of permanent magnets seems highly variable..."
Response to the use of permanent magnets seems highly variable, with many patients showing little or no improvement. A small number of patients are dramatically benefited and a very small number of patients may be briefly worse following therapy. The low cost of permanent magnets makes them worthy of consideration as an adjunct therapy in the management of musculoskeletal disorders. PEMF therapy has been the subject of much more research, and has proven effective in enhancing nerve regeneration, bone repair, and wound healing. How safe is magnetic therapy? As a whole, magnetic therapy is free from side effects. With prolonged wearing of permanent magnets, patients can become adapted to the magnets, which will then lose their effectiveness. Some practitioners feel that if bar magnets are applied incorrectly, with the south pole touching the patient, the treatment effects will be negative. "Magnetic therapy should not be performed on fresh injuries, in pregnant patients, or on patients using pacemakers." Magnetic therapy should not be performed on fresh injuries, in pregnant patients, or on patients using pacemakers. Caution should be used in the treatment of cancer or in the presence of infection. What is the cost of magnetic therapy? Permanent magnets are inexpensive, although the cost will vary depending with their size and configuration. PEMF equipment is relatively expensive, and treatment costs will reflect both the cost of equipment and the practitioner's time and expertise. Can magnetic therapy be combined with other types of veterinary medicine? 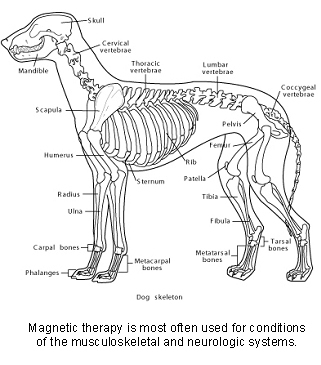 Magnetic therapy can be integrated with traditional treatments or with some alternative veterinary medical treatments. The use of magnets in conjunction with acupuncture treatments is gaining favor with some practitioners. If you are using permanent magnets on your pet, or he or she is receiving magnetic field therapy from a practitioner other than your regular veterinarian, it is imperative that both individuals are kept updated about the ongoing treatment in order to provide coordinated care of your pet, to allow proper evaluation of treatment and to minimize any avoidable interactions or interferences. How can I find out more information about veterinary magnetic therapy? At this time, there is only limited information available about veterinary magnetic therapy, and much of it is potentially biased. Your veterinarian should be able to assist you in evaluating the suitability of specific magnetic therapy for your pet, and may be able to direct you to a reliable source of information on this treatment.